It had been years since I last visited Mutford. Like most of the pretty round-towered churches of north east Suffolk, St Andrew has a lovely setting, in the narrow lanes that wind between Lowestoft and Halesworth. The churchyard is set high above the road, probably as a result of the track cutting down over the centuries, and a path climbs to the church from the west. The view from here is most unusual, for your first sight is of St Andrew's extraordinary Galilee porch, the only one in England which stands against a round tower. It was probably built in the 14th century, but was derelict by the 1930s, when it was restored. The church it stands against is Saxon in origin, the tower largely so, apart from the 14th century octagonal belfry like those at Gisleham and Ashby. It is Suffolk's tallest round tower, and one of the most beautiful. The combination of Galilee and south aisle give it a rather pleasant off-centre look. The south chancel chapel was demolished in the 19th century, resulting in the rather startling brick wall at the end of that aisle, and a domestic window set in a brick-filled arch in the south wall of the chancel. But in a way these contribute to the sense of a lovely old building, and it is a splendid sight across the fields. The graveyard was beautiful on this sunny late summer day, full of interesting 17th and 18th Century headstones. I stepped into the uneven brick floors of the south aisle, so much more attractive than stone or tiles, and saw ahead of me a large black rectangular wall painting. It clearly once contained text, and was probably a 17th century decalogue, like that at Sweffling. When Cautley came in the 1930s, he could still make out the outline of the lower part of a St Christopher painting under this, and mentions the scallop shells at his feet. But these have completely disappeared now, and it would take more than a little imagination to conjure up any trace of them. Arthur Mee also saw it in 1940, when compiling The King's England - at this time, the shells at the Saint's feet were so clear, that Mee spotted a monk peeping out of one (perhaps in the manner of the carving at Wordwell). When I 'd first read about it, I'd wondered if Cautley had actually seen the remains of Moses or Aaron, as on the decalogues at Chediston and Somersham, but you can indeed just make out the legs of the Saint in the conventional place. Probably, the figure was whitewashed in the 15th Century, and then this bold, almost oriental signboard painted some two hundred years later, with the Ten Commandments and the words of the Apostles' Creed on it. I don't think it was a conscious attempt at iconoclasm. I am told that, in a certain light, you can still make out some of the words. There is a surviving 15th Century dedicatory inscription on the font, showing that it was donated by Dame Elizabeth of Hengrave in 1380.There is a beautiful piscina in the south aisle, which Mortlock thinks was probably to the chantry altar of the guild of St John the Baptist, which existed in the village before the Reformation. On the opposite side is the unusual feature of a tomb recess in the north wall, the Norman canopy of which seems to have been rescued from elsewhere. Mortlock thought it might have been the 12th century chancel arch, which was replaced in the 14th century. Another possibility is that it is a Victorian faux-medieval conceit. 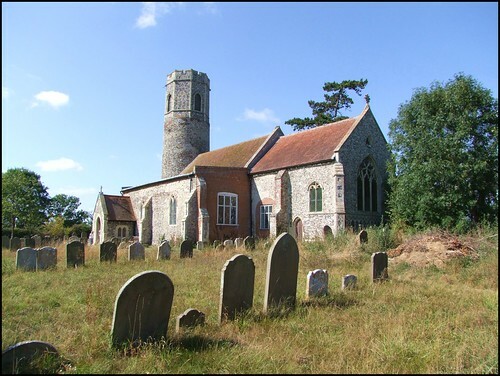 Back in 1973, the poor condition of this church, and its remoteness from civilisation, made it one of the first in Suffolk to be scheduled for redundancy. The tenacity and energy of local people meant that this was not allowed to happen, and a programme of repairs was put in hand that continues to this day. The church feels full of life, the heart of a busy, worshipping community. Nearby Rushmere St Michael has also been saved, so the local people really are to be congratulated.